Smart home security company Ring has revealed a total of 13 new products at CES 2019 in Las Vegas, showcasing everything from its latest peephole camera to a new range of outdoor smart lights. 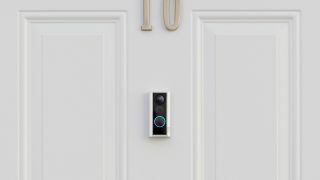 The new Door View Cam works like Ring’s previous doorbell cameras, but instead of replacing your doorbell, it replaces your front door’s peephole. It's completely wire-free thanks to a battery that sits on the inside of your door, the Door View Cam requires no permanent alterations, making it a great option for renters. Like the Ring Doorbell 2, the new peephole camera offers motion detection and streams 1080p video straight to your phone via the Ring app, as well as allowing you to talk to whoever is standing on your doorstep. What sets it apart from previous models is a built-in impact sensor that can automatically detect when someone knocks on your door. If you think you’d miss your old fashioned peephole, fear not: the Door View Cam can be used just like an analogue glass peephole should you wish. Ring says that the Door View Cam will be available in the US and UK, as well as a few other European countries later this year for $199 / £179 – this works out at around AU$280 based on current conversion rates, but so far the company hasn’t released any official pricing or release schedule for Australia. "Alexa, show me my front door"
The company has also launched a new line of Ring Smart Lighting products. The new range, which includes floodlights, spotlights, and motion-activated path lights, is designed to create a chain of security lighting around your home. When one light is activated, it triggers others in the chain and notifies you via your smartphone. You can take this sequence even further if you have a Ring Protect Plus subscription; the Ring Smart Lights can then prompt Ring Doorbells and cameras to start recording. As well as the new Door View Cam and Ring Smart Lighting range, the home security company has also launched a number of accessories to link up to your existing Ring Alarm system, including a flood/freeze sensor, and a CO/smoke listener that listens out for your smoke or carbon monoxide alarm and alerts you when it goes off (in case you hadn’t already noticed the ear-splitting screech on its own). As Ring was acquired by Amazon in early 2018, it’s no surprise that the new products are Alexa-friendly. That means you can ask Alexa-enabled devices to show you real-time footage from your front door and turn on your smart lights, as well as enabling you to speak to people on your doorstep via your Echo Show, Echo Spot, or Alexa-enabled tablets.